They’re scattering to places around the United States, Canada and England. Some know exactly what career they want to pursue, while others still haven’t figured it out. For some, their time living in the Cayman Islands is coming to an end. 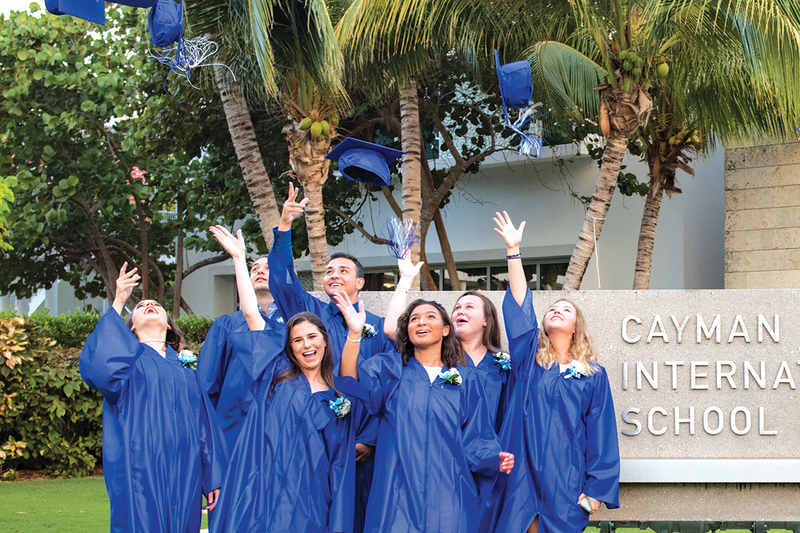 Of the 25 graduates of the Cayman International School class of 2017 – the school’s largest graduating class to date – 24 are going to university in the fall, while the 25th will wait to start college until after a four-year stint in the U.S. Navy. They will miss their friends, they will miss their family, but they are ready to embrace the next phase of their lives. Just hours before graduation, class valedictorian Camila Pantin was still trying to process in her mind what was about to happen. “It still hasn’t hit me … that [Cayman] won’t be the place I’ll be living for the next few years,” she said. This autumn, Camila starts at the University of Notre Dame, where she’ll study liberal arts for the first year, with the idea of eventually entering the school’s College of Business. Originally from the Canary Islands, Erik is heading off to the U.K. – probably Bath – to study chemical engineering at university. He doesn’t see himself coming back to the Cayman Islands to live. “I hope to come back to visit,” he said. Graduate Theo Nielsen will continue a family military tradition by joining the U.S. Navy. His great-grandfather fought in World War I, his grandfather in World War II and his father was a U.S. Army Ranger in the early 1980s. After spending four years in the Navy, Theo plans on attending university. He said that he thought attending CIS was a wonderful experience. Dani Scott is moving to New York City to attend The American Musical and Dramatic Academy, a college conservatory for the performing arts. Dani, who is the daughter of EY Regional Managing Partner Dan Scott, said she loves New York City and even though she grew up in a place as small as Grand Cayman, she is looking forward to living there. “This quote reflects confidence and I admire this confidence that you have as you move on to new adventures,” said Jeremy, then challenging the graduates to define their direction. Jeremy told the graduates that he hoped their goals were not as simple as personal wealth and he said a Harvard University survey surmised that the secret to happiness was achieved through four actions. “Cherish your most important relationships,” he said, citing the first action. “Be a contribution – not make a contribution, but be a contribution. Remember that by helping others and helping our world, you are also helping yourself. Whatever this very capable group of young men and women do in their future, they have already had a huge impact on the young students at CIS who look up to them as example and models. They will be missed by younger peers and teachers alike, and have set a high standard that will be hard to match.